No, that’s not a typo and NO, THIS ISN’T GOING TO HEAD IN THE DIRECTION YOU’RE THINKING. Well, unless you read the second half of the title and that direction is towards Beer Soap. But yes, Beer Soap. It’s a real thing. I guess I’ve always known that it existed, but never really saw any examples of it until about a month ago when Brooklyn Brewery announced the sale of a three soap set, with each soap being made with lager, brown ale or black chocolate stout. I couldn’t hit “order” fast enough, but when the cost of shipping exceeded the cost of the actual product ($10 for the soap, $15 for shipping) I decided to close that order window and wait for when I actually head down to Brooklyn in June. But I had the bug. I HAD to try a beer soap. So, on the advice of a friend I searched Etsy and it was there that I found the good people at The Beer Soap Co. from Miami, Florida (Their non-etsy site is here) and…wow. Not only did they offer beer soaps for significantly lower prices, but the amount of beers they turned in to soaps was staggering. It was kind of a shame that this wasn’t a real store otherwise I would be dancing in it. After going through only a portion of the intimidating selection, I settled on a soap made from Delirium Tremens. Partly because it’s one of my favorite beers and I’m a slave to the little pink elephants, but also because I enjoy the aroma of it and wondered what it would be like as a soap. A few clicks and a 2-3 week wait later, and I had a very nice-smelling package waiting for me in the mailbox. Now before I get in to a review of it, let me get this out of the way: You aren’t going to smell like you just poured beer on yourself. If that were the case it would be far cheaper to just pour the contents of a bottle all over you and you’d probably get the exact same looks of judgement and pity. 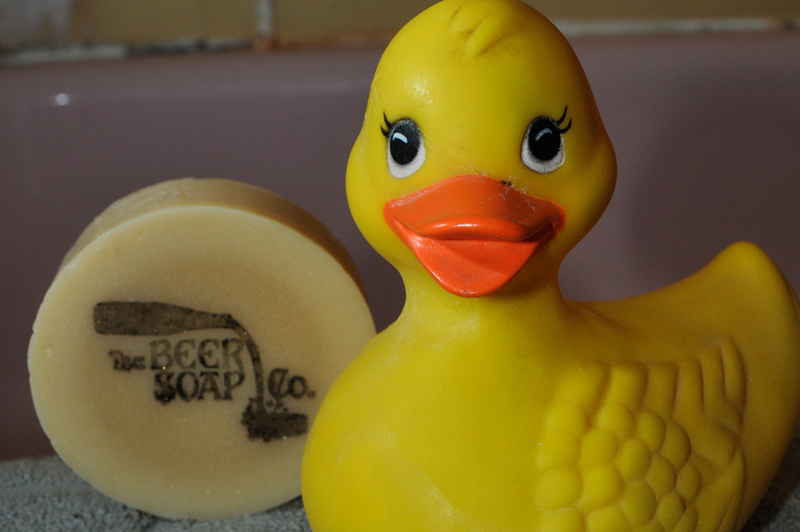 While the soap is made with beer, the people at The Beer Soap Co. have added essential oil blends to ensure that you can use this and still be taken seriously at a job interview. Right, onwards to the review. COLOUR – Skin coloured with dark flecks all over. There’s an inner circle that is slightly darker than the the outer circle (see picture to get what I mean). AROMA – Mmmmmm…Eucalyptus is the strongest scent here! With the smell of Oak hitting next and lingering the most. The product description says Birch and Tobacco are also in this, but my nose isn’t refined enough to sense it, I guess. And of course, there is the slightest hint of the beer itself, which brings a nice, subtle fruity finish. Also, the coconut oil that’s in this can barely be noticed, but it’s there. BATHING – Once water hit the soap the overpowering smell immediately went down. Lathering took a while, but was okay. In all honesty if you use a loofah, put it away and just use the bar as it’s less of a hassle. Very creamy texture to it which is owed to the Shea and Cocoa Butters in it. VERDICT – The saving grace for this soap is how smooth it leaves the skin feeling. My skin is usually extremely dry and I may well just hold back on the moisturizer. Other than that…if you’ve had homemade soaps with oil blends before, you aren’t missing too much with this one, although it’s subtlety in scent can be admired. From a personal note it’s nice that I’m not reeking of the scents that make this soap, which is a problem I’ve had with friends who go a little too “I want to put ALL THE SANDALWOOD in this!” with the soaps they have made and given to me. I should say that it is now, post-shower, where the scent of the beer is starting to come out a bit more. And that is lovely. To be honest, I have a feeling that if it weren’t for the novelty of using beers to make the soap, I’d have given these a miss. But as it stands they DO use beers to make this and I’ll most likely be ordering more to compare and give in to the family addiction of collecting things that I have fought for so long. It’s a fun idea, fairly cheap and a pretty good soap, so why not? At the very least it’s worth buying one to satisfy your curiosity. Hell, this soap came with a sample that is made with Brooklyn Red Lager called “The Hipster“. While I’m not part of the thick-rimmed glasses and jeggings crowd, I am interested to try it out in the future. Black Oak is selling beer soap too.